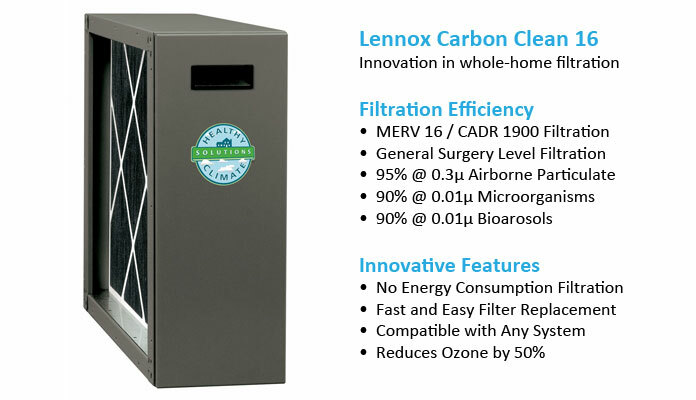 One of the industry’s highest-rated whole-house air cleaner and filtration systems, the Lennox Healthy Climate® 16 Media Air Cleaner provides superior air purification Minneapolis at an affordable price. With a Minimum Efficiency Reporting Value (MERV) rating of 16, the Healthy Climate 16 Media Air Cleaner removes more than 95% of allergy-aggravating particles down to .03 microns and over 90% of bioaerosols and micro-organisms down to .01 microns. The MERV is a filter rating that categorizes the size of the holes in the filter that allow air to pass through. 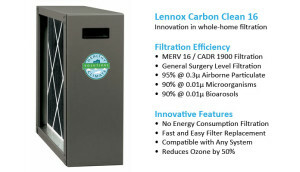 The higher the MERV rating—ranging from 1 to 16—the better the filtration, meaning this whole-house air cleaner provides near-perfect filtration performance. What’s more, the Healthy Climate 16 Media Air Cleaner emits no Ozone, a known lung irritant. For more information on the health benefits of an air purifier, or to install an air purification system in your home, contact Minneapolis, MN based Ray N. Welter Heating Company at 612-825-6867.